The Mission House (built in 1751) was built by the Danish Christian missionary Poul Egede and was in service until 1880. It was intermittently inhabited until the mid-1980s. The Shop and Store Building (built in 1777) maintained its original use as a warehouse until 2012. The restoration of the two buildings, some of the oldest structures of their kind in Greenland, is part of a larger partnership between the government of Greenland, the National Museum of Greenland, Qaasuisup Kommunia, World of Greenland and the Danish philanthropic investor, Realdania By & Byg. Both buildings were in extremely bad condition and in urgent need of restoration when Realdania By & Byg bought them in 2013. However, the buildings still contained a high level of integrity and authenticity. Through the careful process of preserving original materials, such as the timber, windows and doors, and original details, such as the ceiling canvases made from ship sails, the two buildings have been restored and given new functions while their unique qualities and atmosphere have been maintained. The buildings were opened to the public in June 2017. The Mission House is now in use as a restaurant and lounge. 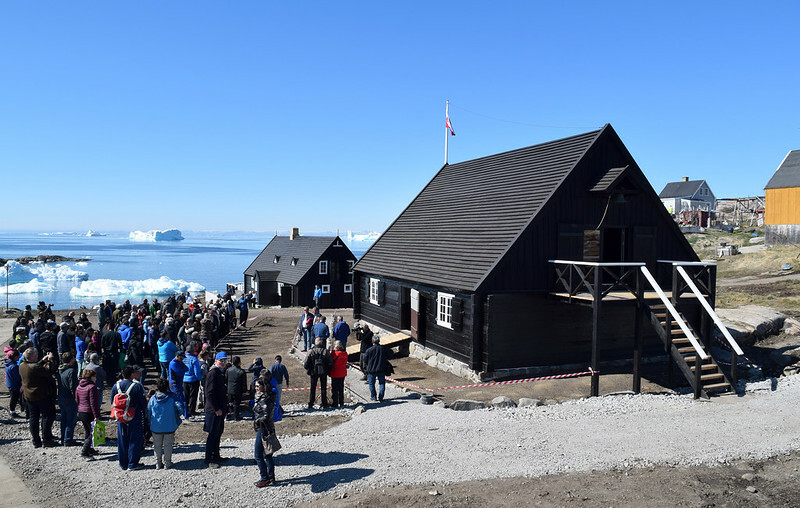 The Shop and Store Building is used for conferences and for an exhibition about the restoration, the nearby UNESCO World Heritage area of the Ilulissat Icefjord and the upcoming Icefjord Centre in Ilulissat. The shop is now used for the sale of local crafts and there is also a cold storage facility in the building so that local fishermen and hunters can sell their catch and prey. The new functional uses of the buildings contribute to the economic sustainability of the small, local community and help to maintain the unique traditions of settlement life in Greenland. In addition, the employment of local craftsmen in the process has provided training and strengthened competencies in Greenland in the field of restoration. The jury commended this aspect of the project, noting its “important educational component”. A book which tells the story of the buildings has been published in Danish, English and Greenlandic. Further efforts have been made to develop the public’s understanding of the conservation and the advantage of viewing cultural heritage as a socially useful resource. The positive results of the project have generated inspiration for similar settlements to preserve their heritage. The jury highlighted this aspect of the project noting “this project emphasises the significance of vernacular architecture and is a model for other similar buildings in Greenland and throughout Europe”. In a European context, whaling flourished in Greenland’s waters in the 17th century. At that time, the settlement was a well­ known trading post, where European whalers met with Inuits to trade goods. Now the settlement is once again equipped to receive visitors from all over Europe.